Home Lifestyle Island Floating Rafts: Our Top 11 Picks! If you’re in the market for a floating island raft, you’ve come to the right place. We’ve thoroughly tested over 20 different products, and only 11 have made it to our list of the best floating islands. Our review procedure included testing the durability, convenience, stability, checking out all the features, and more. In addition to that, we’ve also reviewed some bonus products which will take your river island experience to the next level. So, what are you waiting for? 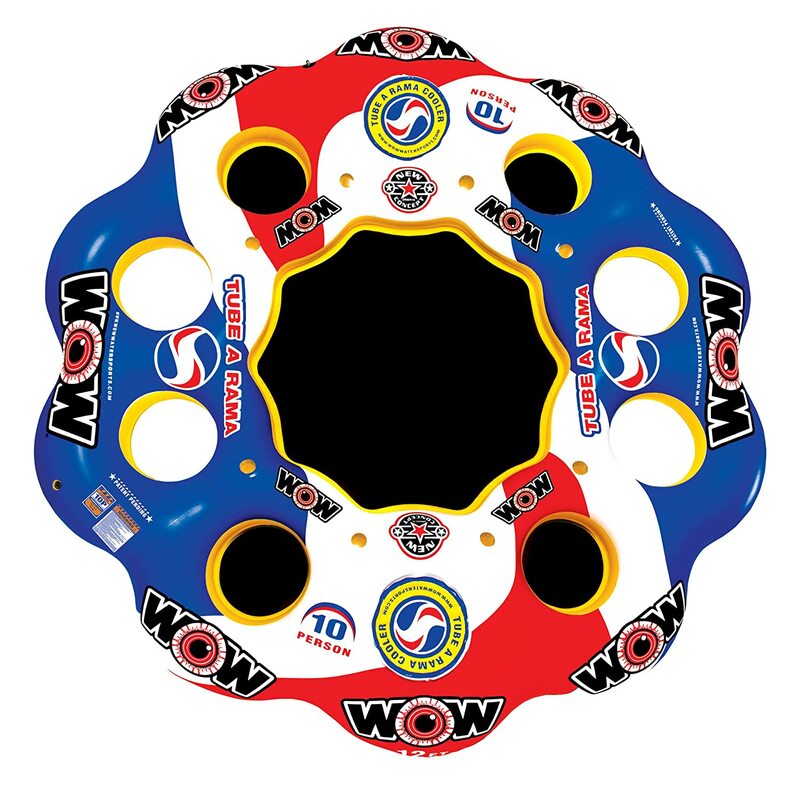 Read along to find out which floating island raft is the perfect fit for your needs. 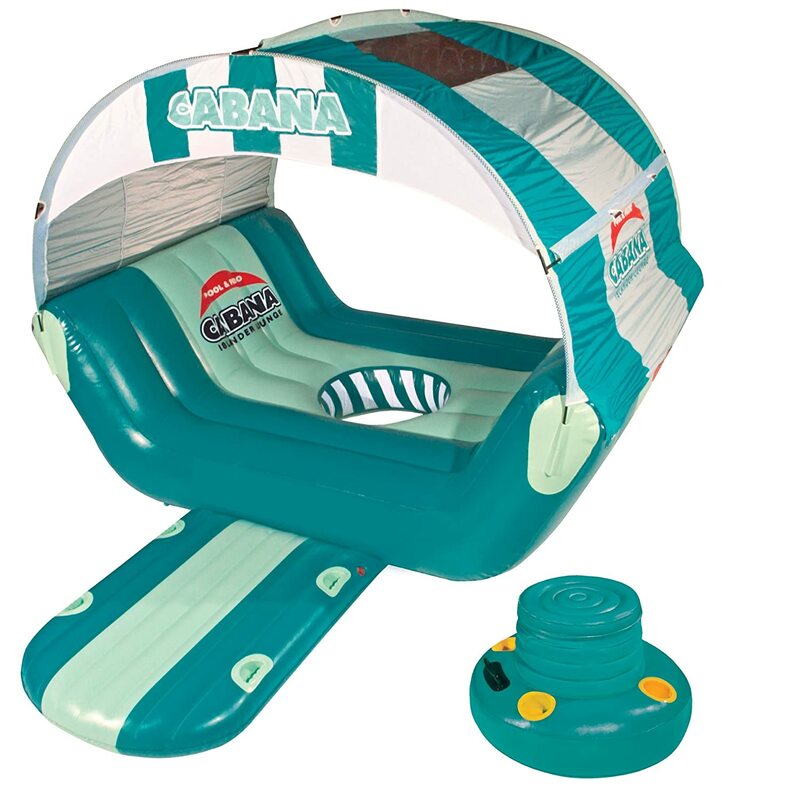 This inflatable floating island delivers comfort and easy setup. 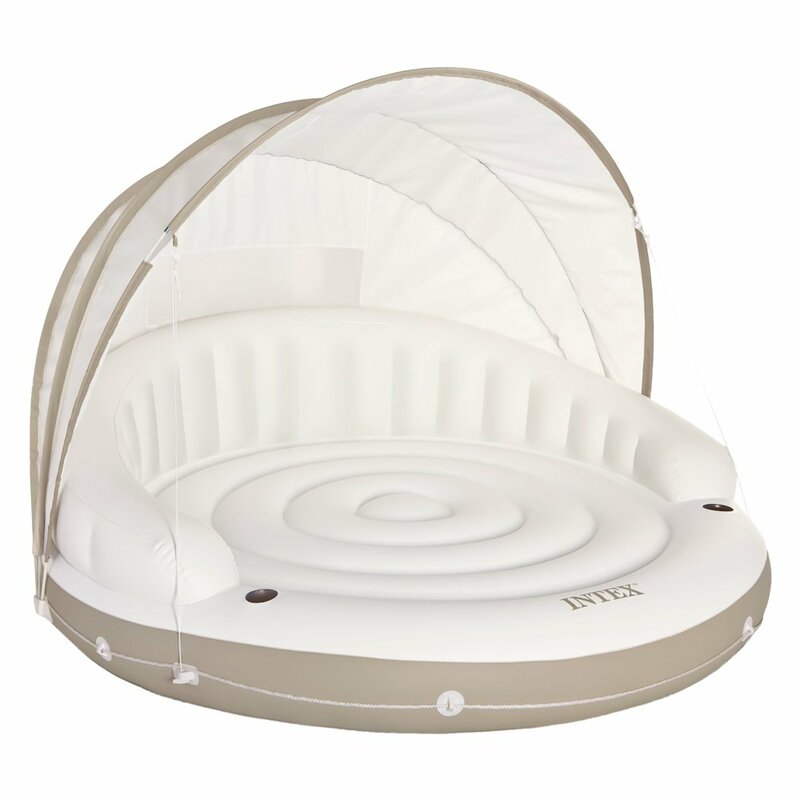 The best thing about Intex Canopy Island Inflatable Lounge is that it costs less than an actual canopy but delivers more comfort. Perfectly suitable for two adults, we were able to assemble it in a matter of minutes and the shade provided is such a relief for the hot sunny days. It took us about 15 minutes total to inflate it and set up the sunshade. Incredibly spacious and comfortable, we relaxed on this lounge for hours over our pool and didn’t even notice how the time passed until it was evening! Look nowhere else if you want to relax in the water with your friends or family. We were taken by surprise by the loads of hidden gems that came with this floating island raft. First of all, it is perfectly suitable for 4 adults and provided us with a lot of comfort, especially with the feature of backrest cushions. Secondly, it has an open bottom in the center so if you want to dip your feet into the water, go right ahead and do it. Thirdly, it comes with two coolers which kept our beverages cold, so we could stay in the water for as long as we wanted. This giant inflatable floating island is a perfect go-to if you have a bunch of people with you to hang around. With space to fit as much as 6 people, we were completely satisfied with this one. And with the many extra functions it came with, it can easily compete with any one on this list for the title of the best floating island. With extra-large pillow backrests, six cup holders, one cooler and an open base to dip your feet in the water, you just cannot ask for anything better. And on the top of that, it also comes with a sunshade which is easily assembled and can make sunny afternoons more relaxing. Spacious, comfortable, easy to assemble and with tons of other features, we were surprised by how spacious this raft is. It has 4 seats with giant pillow backrests, with room for 3 more people to lay around on the deck. 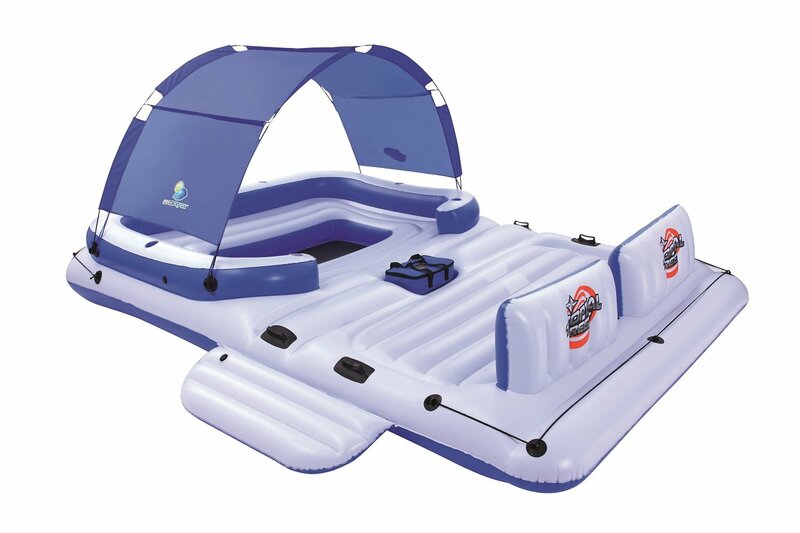 This floating island raft has two separate inflatable boarding platforms to make it easier to climb on the raft. It also has an anchor bag to fill sand in and keep the raft moored. With six cup holders and one cooler, you don’t have to worry about getting out of the water to get more stuff as it had so much room for storage. 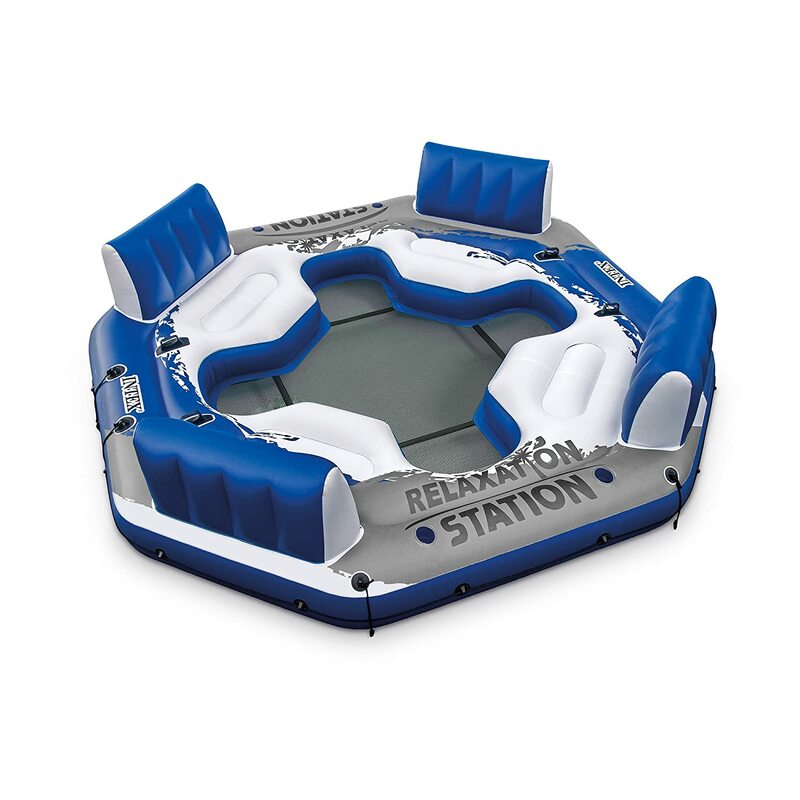 We ordered this relaxation station of an inflatable floating island for a pool party and were not disappointed. The design is pretty simple, but offered more comfort than we could have imagined. With four comfortable seats with extremely cozy pillows, whole afternoons can be spent in this without the slightest of discomfort. There are 4 cup holders that make carrying beverages easier. It took us 10 minutes to inflate it perfectly from an air blower, and it was very easy to carry too. Even after deflating, we could fit it inside a box. It takes a lot less storage space than some of the other ones on this list. This behemoth raft was the best decision we took for our party. With room for 6 adults and the comfort of dreams, we couldn’t have expected better. 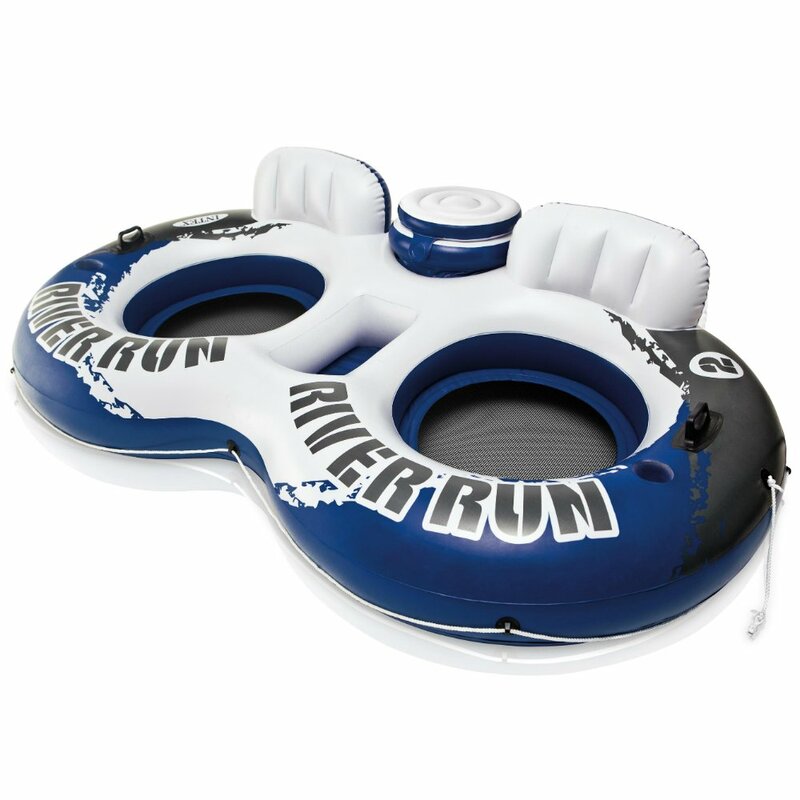 With a detachable sunshade, we could stay on this raft the whole day without any problems. It also came with a 16-quart cooler with cup holders which made the stay on it even better as it had so much room for food and drink storage. It also has a center swim porthole, where you can just dip your legs in the water, or just dive in completely! The separate inflatable boarding platform was also a big help in boarding the raft from the water. 10/10 would recommend. Perhaps the best thing about this island is that its mesh center lets you sit on water instead of plastic. 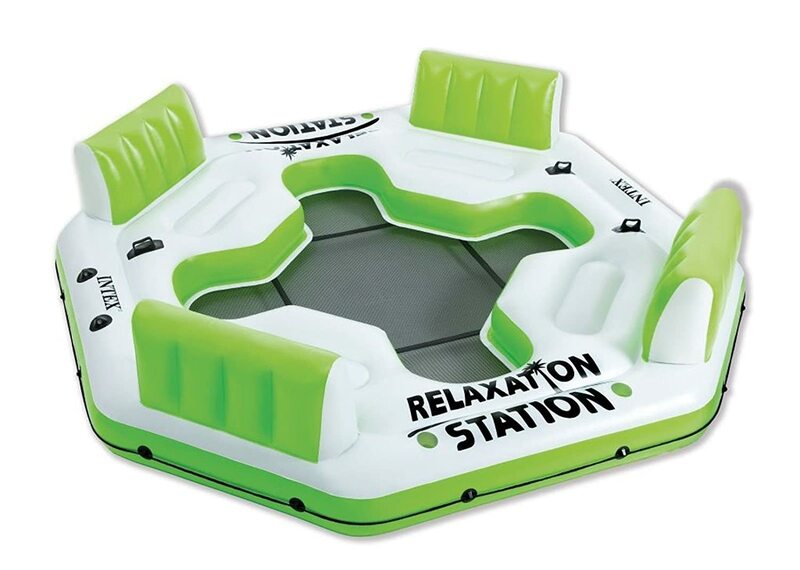 This let us chill in a lake and kept our skin cool as we enjoyed our favorite drinks from the inflatable cooler. The cup holders came pretty handy too. While the island fit a small army of people inside, it does take an army to carry it back to land. The material is strong and holds up well. The arms rests and back are comfortable. Overall, we think this is a pretty decent option if you are planning on buying an island. Now this one was perhaps designed with lovebirds in mind because it comes with only two seats. But, it’s also perfect if you want to enjoy a few beers with your best friend while chilling in the water. The built-in water cooler kept our drinks fresh while the mesh bottom kept our skin cool. The cup holders are a good addition and the material seems hardy and strong. The connectors are easy to use. When deflated, this was about 951/2” x 62” in size so it was easy to carry too. Now this giant floating island can fit a few families in it. With 8 seats, four of which are mesh and four of which aren’t, it fits ten people easily and still have some space left. This also comes with not one but two built-in coolers, so we did not have any trouble storing our drinks. There were only 8 cup holders, though, but that is okay! The center is mesh again and can fit more people if you want. The PVC material it is made of seems durable and should last a long time if you choose to buy it. The Bestway Lazy days island is again suitable for a family day out. With three very wide and comfortable pillow backrests, this fits at least 6 people in it. The bottom is fully mesh so cooling is not an issue either. There are also cup holders that will take care of your drinks. The only thing lacking is a cooler, but we suppose one can’t have it all. The material is apparently puncture resistant and seems very durable. Overall, it is a good buy if you are looking for a compact family-sized floating island that does not burn a hole into your pocket. 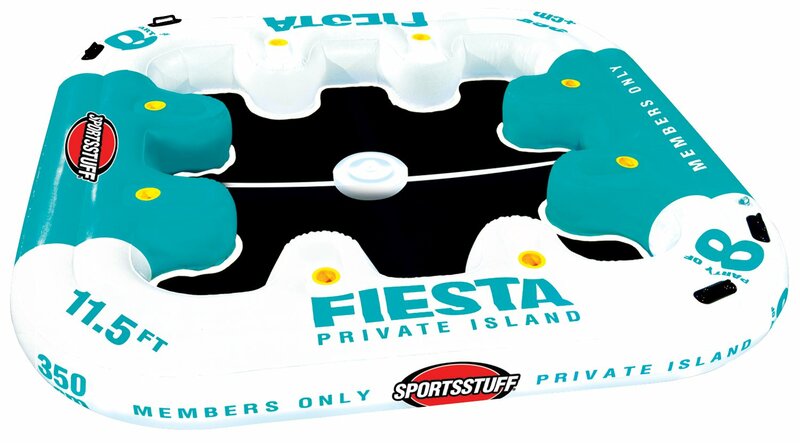 Another good option if you are looking for a floating island that is cheap and durable. It fits a small family of four easily and comes with drink holders dedicated to each person. Again, we missed the water cooler. And the bottom is not mesh so there is a little cooling issue. The material is 18-gauge vinyl so pretty durable. The best part about this one was the strong plastic steps that made climbing on very easy. We would recommend this if you do not want to spend serious cash on a luxurious float because this served the purpose pretty well too. Since a floating island raft tends to get expensive the moment it includes a water cooler, we realised that buying one separately would be better. The Mega Chill water cooler by Intex can hold up to 72 cans of your favorite drinks and ice. The handles are heavy duty, durable, and make it easier to carry the cooler wherever you go. 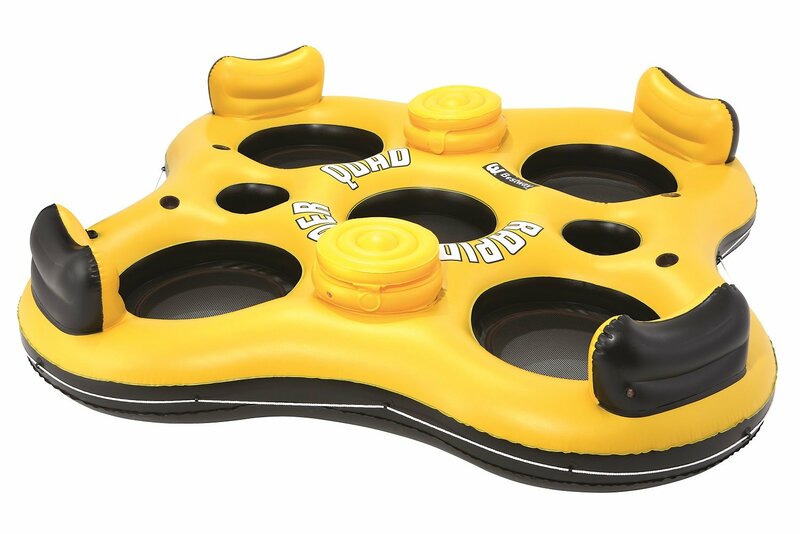 It also has 6 cup holders so you can relax and enjoy the water without worrying about your drink. 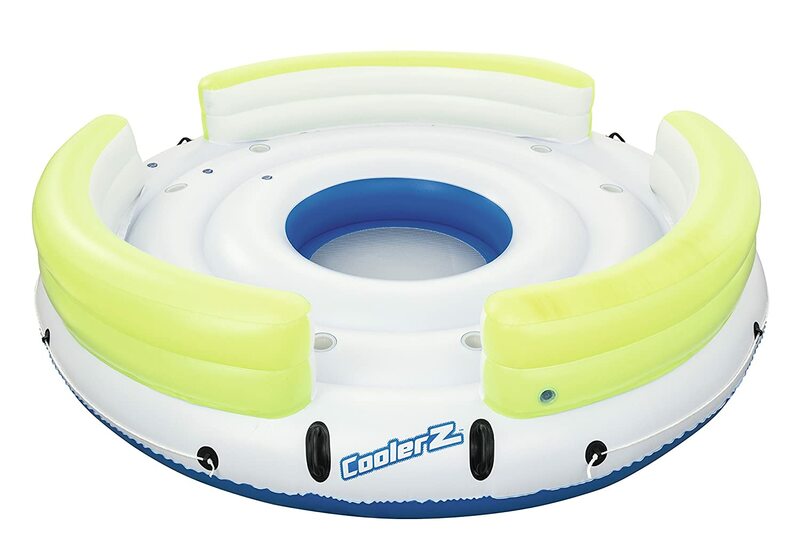 It can float up to a 48-quarts cooler with ease. The ice-chest is removable so it was easy to fill when you run out of ice. 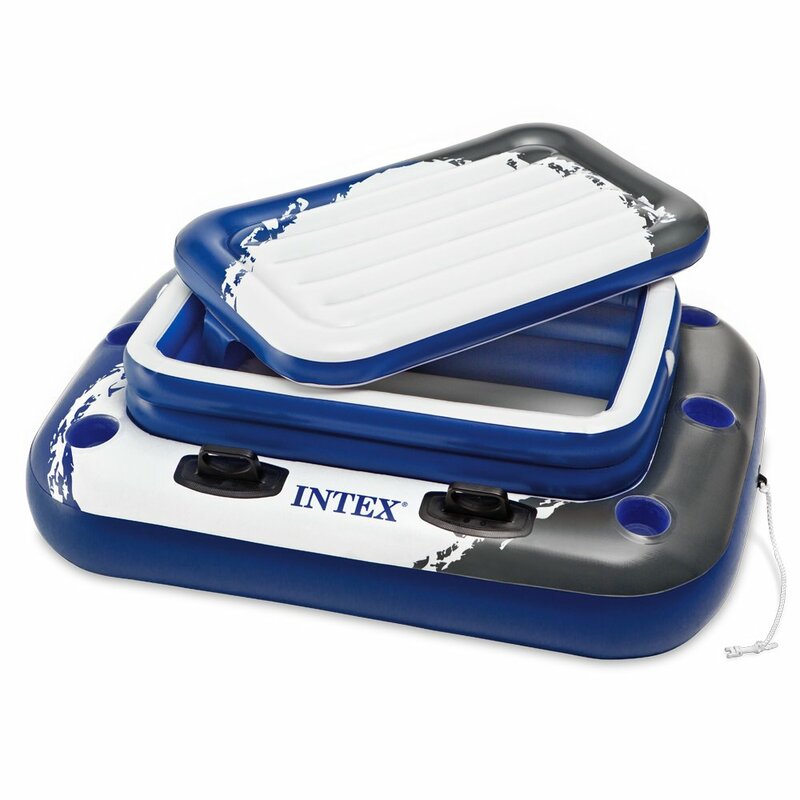 Intex Quick-Fill AC ZAZ Electric Air Pump: It’s an excellent product that’ll allow you to fill up the floating raft effortlessly and in a short span of time. Airhead Hi Pressure Air Pump, 120v: Another air pump that’s moderately priced and boasts of incredible pumping capacity. Well, this brings us to the end of our guide. Did any of our recommended items manage to catch your fancy? Let us know in the comments section below. Previous articlePool Pumps Reviews: Our In Depth Guide!